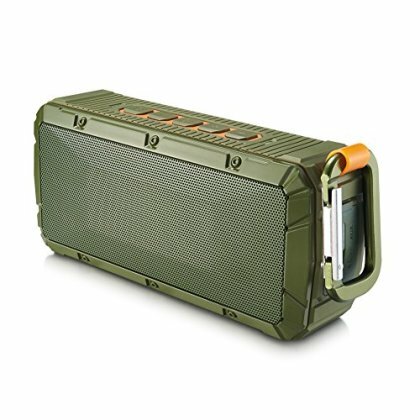 built-in MIC Bluetooth speaker and hands-free function, you can conveniently pick up a call by the speaker in car, bathroom, at home or office, anywhere during it is connected to your Smartphone.fits a variety of Bluetooth devices . It is waterproof and dustproof, no worry while travelling. the speaker will allow you to easily attach the speaker on the wall or any flat surfaces. Perfect for shower, bath, swimming pool and boat. Bluetooh 4.0 speaker(fully backward compatible) with up to 33ft/ 10m bluetooth signal for all Bluetooth-enabled devices; Alternative 3.5mm audio jack for non-Bluetooth devices.Easy pairing and connection to Bluetooth devices without code/PIN. Release your favorite music in minute. Big Wave IPX6 waterproof protection, can last 2-3 minutes of Resistance 3 meters underwater depth of 100 liters / min flow rate, pressure 100n / m of. Built-in 2200mAh rechargeable Lithium Ion battery offers 10-15 hours of play time. Built-in high sensitivity Microphone, hand-free telephone calls.